With a few miles under your belt, you’ll realize that the subject is too broad, situation dependent and personal for there to be ‘best’ pieces of gear. We’ve outlined some timeless, Pacific Crest Trail proven guidelines. Light is right, sort of. Exposure to cold and hypothermia are serious threats in the backcountry. While the PCT is usually sunny and warm, the weather can still be as nasty as you’ll ever see. Some of the worst weather in the country can and does, occur on the Pacific Crest Trail. Always carry equipment for foul weather, even during the summer. A lighter pack is much easier to carry. 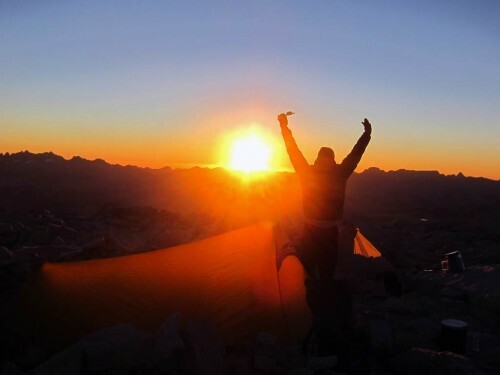 Modern ultralight backpacking equipment and technique was born on the Pacific Crest Trail. The trail is perfectly suited for well-chosen lightweight gear. Equipment and research are no substitute for experience. Reading books and websites cannot teach you the skills that you need to safely travel the trail. Get out and test your gear when the consequences are low. All gear involves compromise. None of it is perfect. Experienced hikers carry a wide variety of gear. No equipment is perfectly suited to all conditions. Risk tolerance, fitness, skill, experience and desire for personal comfort play an important part in finding the right gear for you. Your gear should change if you’re out in winter or the shoulder seasons. Keeping your summer ultralight kit in September in the North Cascades may be dangerous. You’ll learn when the weather turns foul. It’s easy to camp and hike on a warm sunny day. Frankly, your equipment doesn’t matter all that much in those conditions. Long cold rain, wind, heat and other extremes will test you and your gear. Be prepared. A PCTA staffer in the Sierra Nevada. You should carry the Ten Essentials. The point of the Ten Essentials list (developed by The Mountaineers in the 1930s) has always been to help answer two basic questions: First, can you respond positively to an accident or emergency? Second, can you safely spend a night—or more—out? The list has evolved over time from a list of individual items to a list of functional systems; the updated Ten Essential Systems list is a great start for what you should carry when you travel outdoors. Always carry a detailed topographic map of the area you are visiting, and place it in a protective case or plastic covering. Always carry a compass. You may also choose to carry other navigational tools such as an altimeter or global positioning system (GPS) receiver; other aids include route descriptions, trip reports smartphones and photos. Even if your party plans to return to your cars before dark, it is essential to carry a headlamp or flashlight, just in case. In an emergency, you may be required to move at night. Often it’s too dark to do it without a headlamp. Batteries do not last forever, so carry spares at all times. Carry the means to start and sustain an emergency fire. Most people carry a lighter or two, instead of matches in a waterproof container. Either must be absolutely reliable. Firestarters are indispensable for igniting wet wood quickly to make an emergency campfire. Where firewood is nonexistent, it is advisable to carry a stove as an additional emergency heat and water source. Knives are so useful in first aid, food preparation and repairs that every person should carry one. Other useful repair items are safety pins, needle and thread, duct tape, nylon fabric repair tape and cordage. If your shoe breaks apart or your backpack strap rips off, you should be adequately prepared to deal with the problem. If you are not carrying a shelter, carry some sort of solution for providing protection from rain and wind, such as a jumbo plastic trash bag. Another possibility is a reflective emergency blanket. It can be used in administering first aid to an injured or hypothermic person, or can double as a means of shelter. We’ve made no recommendations for specific pieces of equipment. If you’d like to learn what others are using, we recommend joining the conversation online or reading PCT trail journals.